Triple Glazing Heat Retention Benefits. Keep Your Home at The Right Temperature With Effective Triple Glazing. In the last couple of years, many homeowners have been encouraged to switch from double glazed to triple glazed windows. It’s possible that you didn’t notice yet, but there has been increasing pressure to improve energy efficiency and performance of windows to keep your home at the right temperature. We’re gradually reaching a stage where standard double glazed windows won’t be enough to achieve the maximum possible energy performance and Triple Glazing Heat Retention Benefits. In the United Kingdom, the most common method of comparing the different aspects of energy performance of windows has been the U Value measurement. In fact, this scale is also used for floors, roofs and walls. With just one pane of glass, traditional windows have U Value over 5. Double glazed windows have U Value around 3. However, effective triple glazing has U Value less than 0.8, as required by the new regulations. The primary objective of glazing is to provide homeowners with better sound and thermal insulation than other types of windows. It is very likely that the UK building regulations will specify triple glazed windows as standard on any new buildings in the coming years. Adding another layer of glazing has a major impact on thermal insulation. It does not allow heat to escape through the window. Triple Glazing Heat Retention Benefits. Thus, it leads to an energy efficient home with the right temperature. In order to maximize the insulating effect, manufacturers use two air or inert gas pockets to trap heat. There’s an optimum gap of 16 mm between each pane of glass. This gap is filled with an inert gas for better insulation. Due to low thermal conductivity, your house stays warm in winters, and cool in summers. 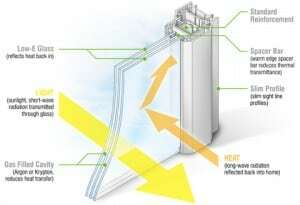 Triple Glazing Heat Retention Benefits. The key benefits of effective triple glazed windows are associated with more comfort. When you insulate the roof, floor and walls of your home, but ignore glazing the windows, it leaves many cold spots surrounding the windows in your home. These cold spots can draw away heat from your home, and cause condensation on the window panes. comfort to the next level. Triple Glazing Heat Retention Benefits. Heat Absorption. It is very important to understand that windows behave quite differently from roofs and walls. When the sun shines, windows are capable of absorbing some heat. In fact, even the best double glazed windows are capable of being heat contributors over the course of an entire day. On the other hand, triple glazed windows reduce the heat absorption properties of your windows. This makes sure your home always enjoys the right temperature. It is worth mentioning that the British Fenestration Rating Council has come up with a scheme for labeling energy performance of windows. Triple Glazing Heat Retention Benefits. The top rating spots in this scheme have been taken by both effective double and triple glazed windows. In order to make sure your home always stays at the right temperature, you need to choose triple glazed windows. Triple Glazing Heat Retention Benefits. However, effective double glazing and triple glazing requires the work of experienced professionals. Thus, it is important to choose a reputed manufacturer and seller like The Advanced Group.